Can you ever have too many butternut squash soup recipes? I think not! The way those things grow and the enormous size you can buy them in can make soup that lasts you a lifetime. In fact, you’ll want several recipes in your arsenal. 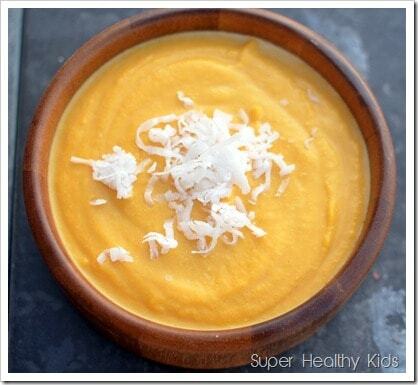 Here’s our Sweet Coconut-Butternut Crockpot Soup Recipe. We used one squash to get 3 cups of chopped squash for our soup, and it made an entire crockpot full of it. Second, we cut the end of of the squash, scoop the seeds out and peeled the skin off. Then, we chopped enough squash and sweet potatoes to get us 6 cups worth. Place squash, sweet potato, onion, 1 cup of chicken broth and butter in a slow cooker, and cook on high for about 4 hours. 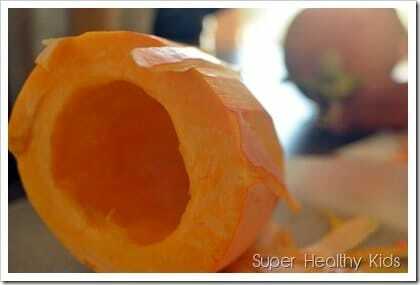 Using an immersion blender, or scooping your squash into a regular blender, puree until smooth. Return to crockpot and add remaining chicken broth, half and half, cumin, and coconut. Cook for about 30 more minutes, or until soup is heated through. Sprinkle with extra coconut for garnishing. Preserving tip: while you have the knife and peeler, finish peeling and chopping the entire squash! 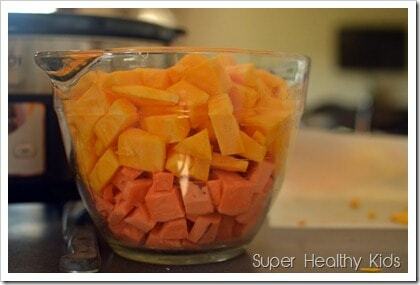 Arrange in a freezer safe bag and freeze for easy soup during the winter!! 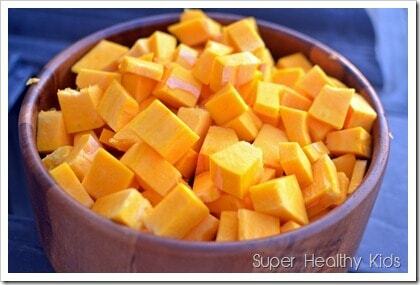 Butternut squash is a great thing to include in your families diet. Winter squash is one of the most concentrated vegetable sources of alpha linolenic acid (ALA), an omega 3 essential fatty acid that is very good for heart health…Dietary ALA reduces the risk of cardiovascular disease. I love how it emphasizes.. DIETARY ALA reduces CD risk. Supplemental ALA must not produce the same dramatic results. Getting our nutrients from whole foods for this reason is essential! Peel and chop squash, sweet potato and onion. 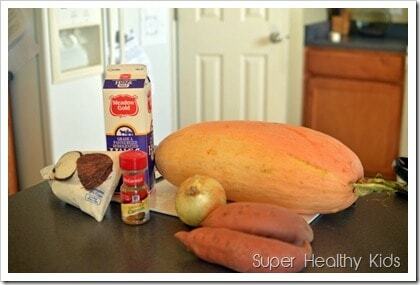 Using an immersion blender, or scooping your squash into a regular blender, puree until smooth. Return to crockpot and add remaining chicken broth, half and half, cumin, and coconut. Cook for about 30 more minutes, or until soup is heated through. Sprinkle with extra coconut for garnishing. Serve with a slice of French bread and chilled grapes on the side. 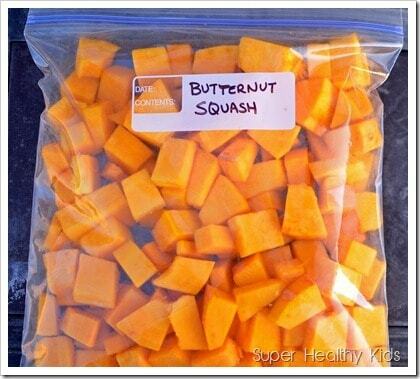 I really need to get me a butternut squash so I can try this. I made this yesterday and it was delicious. I didn’t need to add the second cup of chicken stock and I added about 1/2 tsp of salt. I also cooked it on low for about 8 hours and the house smelled amazing all day. I wonder if adding the cumin at the beginning would add more flavor. We should! Some cinnamon would smell great too. This soup was amazing!!! One of my new favorites! Has anyone made this with unsweetened coconut? Wonder I would need to add agave? YUM! never thought of doing it with cocnut milk – sounds incredible! Need to try this one soon! Your blog is great! I’m going to try this with vegetable broth for my veggie teenager! Sounds great! Is this made with the thick canned coconut milk or regular coconut milk in dairy box? It was the canned variety in the aisle of Asian foods @Pennie. It was the “lite” variety, so it wasn’t super thick, but it wasn’t the dairy box kind. Is there a way you could add a print selection. This would be easier to print without the adds. I think this would be amazing with coconut cream. Just add a little more chicken stock to thin. Cannot wait to try it!!! Thanks Holly! I fixed it. It should be printable now! The squash pictured is not butternut squash, it’s banana squash. 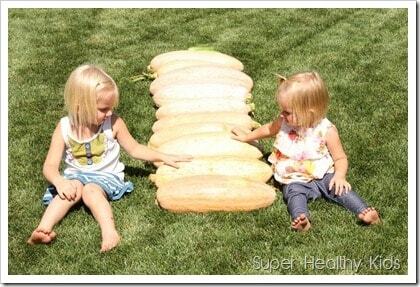 Butternut squash are much, much smaller than these. What other spices can be added to this? It was a little bland for me. I added some pumpkin pie spice to it, but it still wasn’t quite there. I would def. Make it again though! HI @Tracey- If you still need flavor, you could try adding salt. The salt brings out the other flavors well. I added a macintosh apple and a pear to the mix and added pumpkin pie seasoning and some curry… It’s so so yummy, thanks for the recipe!!! Sounds yummy, can you freeze the soup? Heard may not be advisable when cooking coconut milk? I have frozen it and it reheats just fine, Amy. I’m not sure if someone has asked this, but could you substitute pumpkin for the butternut? Hi, My husband is starting an EoE food elimination diet (no dairy, eggs, wheat, soy, nuts, fish/shellfish or legumes) for the next at least 8 weeks while we try to figure out some triggers. Anyhow, this recipe would work if I use coconut milk, but I need a substitute for the butter – would coconut oil work? Any suggestions? sorry Julie! It’s tablespoon, I just changed it. I’ve seen this comment a couple of times, but haven’t noticed a response yet. How many servings does this recipe make? Thanks! I get about 6-8 cups Donna! Can you use heavy cream instead of half/half? I made this soup a couple of weeks ago with the coconut milk. Good, but I wasn’t quite feeling the cumin. I plan to try it again with fresh ginger root, and hopefully it will taste good! I am just a bit nervous on overdoing the ginger since it can be potent. Have you tried other spices/flavors? I haven’t Darcy, but I’d love to hear about it if you do! I made this soup last night and omitted the cumin and added Garam Masala instead. It came out SO delish!!! Thanks for the recipe Amy! Great idea Sarah! Glad it turned out! Any idea about the calorie count for this recipe? Non crock pot version could cooking time? I simmer blended soups for about 20-30 minutes Amy! Is there any way to make this work if I have only frozen butternut squash pieces? So is the squash used actually butternut or banana squash? 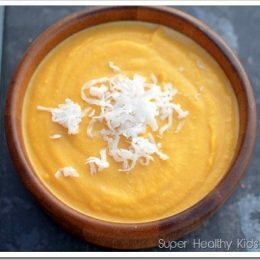 Every picture in the post, including the picture of ingredients, appears to be banana squash but the recipes says butternut. Also, what would you recommend as a replacement for butter to keep it dairy free? It’s true! that’s my fault when I was grabbing photos for this post! The recipe was definitely made with butternut! Coconut oil would be a great substitute! My boyfriend and I have made this twice now! It’s delicious! This turned out pretty good! But what the heck is 7/24 cup butter? I ended up using 1/3. 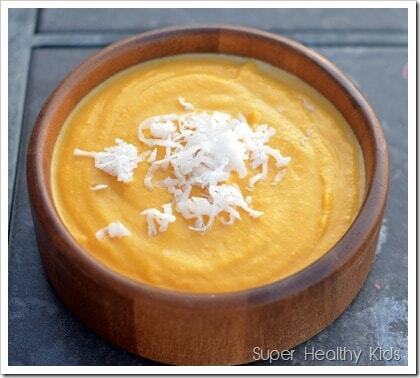 My kids hated the coconut and I think I’ll try it without next time, though I liked it with. I made this with coconut milk, earth balance butter, vegetable broth (vegan) and added coriander and curry powder, plus a little salt. In place of the shredded coconut ( I didn’t have any) I substituted spiced, roasted chick peas seasoned with the cumin and coriander. for the little garnish and a sprig of sage. Amazing and so pretty! This meal is so good! Even my picky eater like the soup (without the coconut). My husband and 9-month-old went back for seconds ?. My 5 year old was a little more critical but he ate it all! We thought the flavour was great, and paired awesome with sourdough bread + warm brie cheese. For the butter, could you replace it with coconut oil? I’m wanting to have it df and going to use full fat coconut milk. Have you tried it this way? I’m going to make it in instant pot don’t take that long. You could definitely sub coconut oil for the butter in this soup. We haven’t tried it, but I am sure it would be delicious! Do you use unsweetened coconut? How big is your crock pot?